This Maple Pumpkin Pie recipe is based on one from an old issue of Gourmet, and 100% of reviewers claimed they’d make it again. As for me, I’m not so sure. It was very creamy and smooth, but not very firm. I’m not sure what happened, but I think it might have to do with the discrepancy in the original directions. The recipe says to boil to soft ball stage of 210 degree F. Soft ball stage is actually 235-240. Some of the reviewers used 210, others used 240. I used 210 and am wondering if the pie would have been firmer if I’d boiled the maple syrup to 240. If we liked pumpkin pie more, I’d make it again and boil to 240, but I’m going to have a hard enough time getting rid of this one. About the maple syrup. Grade B is richer and more flavorful than Grade A. It’s also more expensive. I splurged and bought a 12 ounce bottle for $10.99. While it was good, I’d probably go ahead and use a good brand of Grade A…..at least until I figured out the issue with the maple syrup! In a heavy, medium size saucepan, gently boil maple syrup to 210° F or 240 degrees F. Use a candy thermometer to measure. Let cool slightly. In a bowl, whisk together pumpkin, cinnamon, ginger, salt, cream, milk, and eggs; whisk in maple syrup. Pour pie into crust and bake in middle of oven 1 hour, or until filling is set but center still shakes slightly. (Filling will continue to set as pie cools.) Transfer pie to a rack to cool completely. Donna, thanks for asking! I really appreciate that. And yes, you may use the picture. 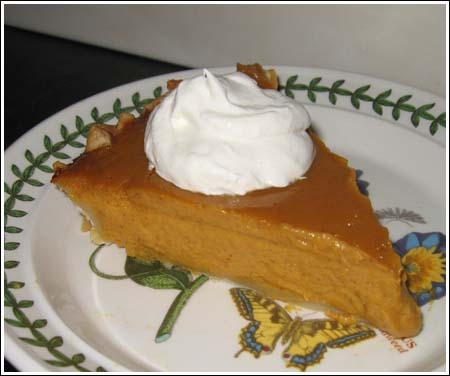 I am making a cookbook for my family and needed a picture of pumpkin pie. I would like to use yours if that’s ok with you. I will not be selling the book, it is just for my family. Do I have your permission to use the picture? I came across this recipe too and had to make it right away. It was Yummy and I thought that the maple syrup really made the whole thing sing. I easily found grade B at Whole foods and did cook it to the “real” soft ball stage. I also added about half of the cream it asked for and swapped out sweetened condensed milk for the balance. I’m not sure that was entirely necessary, but it was firm and velvety. I used the pastry from Kate Zuckerman’s “Sweet Life”. I love this crust as it has a wonderful flavor of its own. 1. Preheat oven to 375F. Prepare and roll out Pastry for Single-Crust pie. 2. For filling, in a bowl combine pumpkin, sugar, maple syrup, cinnamon, and salt. Add eggs; beat with a fork until combined. Gradually add milk; stir until combined. 3. Carefully pour filling in pastry shell. Cover edge of pie crust with foil. Bake 30 minutes. Remove foil. Bake 25 to 30 minutes more or until a knife inserted near center comes out clean. Cool on wire rack. Cover and refrigerate within 2 hours. 4. To serve, if desired, top with Maple Whipped Cream. Makes 8 servings. We love maple syrup! When we lived up in New Hampshire, we used to drive to Vermont and their Cold Hollow Cider Mill where they made their own apple cider and syrup. The lower grade syrups are the absolute best. They give free tastings there and that’s when we discovered that there ARE other grade syrups than usually found in a grocery store. Only problem is that now we’re back in Austin, we can’t find anything other than the grade A stuff. Where did you find your grade B, Anna? Judy, I’m probably being too hard on the pie. Todd did like his piece, but Emma and I were just kind of “eh”. But I never liked pumpkin pie much in the first place….I prefer it in cheesecake form. So I’m kind of interested in hearing what others thing. Hi Mary! Glad you like the picture. It makes me laugh too. The Grade B syrup is defintely stronger….and in a good way. I need to figure out how I’m going to use the remainder. OMG!! Fuzz’s picture makes me laugh out loud EVERY time! Thanks for putting it back! As for maple syrple, I think Martha Stewart had an in-depth article about it- someone did- I know I read one somewhere – America’s Test Kitchen? – but I think the writer said that one of the lower grades of syrup was actually better for baking because the flavor held up after baking. I’m sorry- I have so much mostly useless info floating around in my head (low on RAM you know)it may have had something to do with the amber- darker being a stronger flavor and a lower grade. ERRGGG!! I probably have that all mixed up, but there you go. I shall endeavor to research…..
Anna, you can get a 32 oz. bottle of Grade B at Trader Joe’s for $10.99 if you have one near you. I’m a New Englander transplanted to Georgia, and that’s an essential for me!